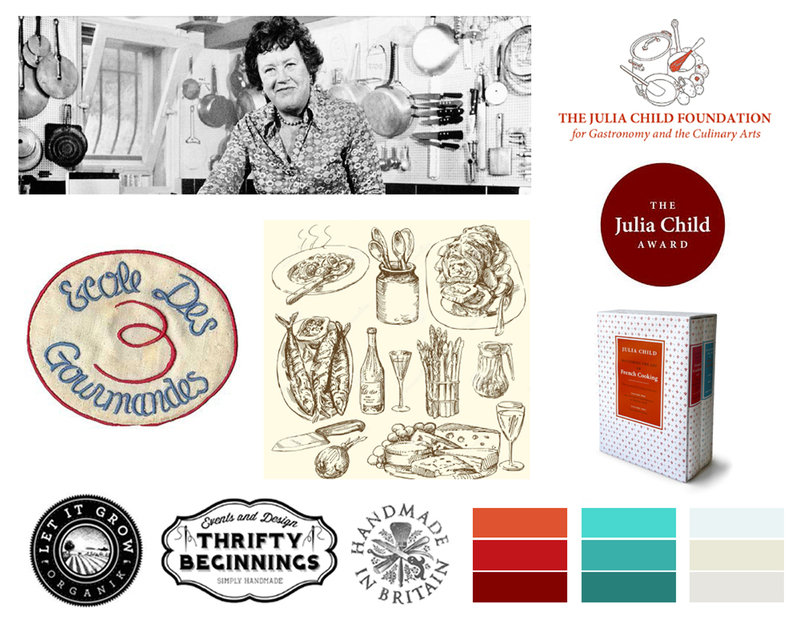 I was chosen out of many international proposal submissions to design the Julia Child Award logo as well as the physical award itself. I was to carry out all responsibilities in developing a concept for both the logo and award, as well, responsible for all steps in the production stages. 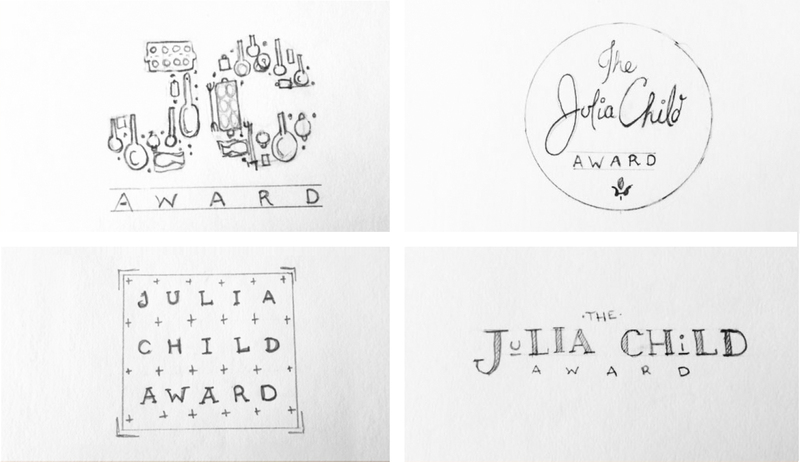 The main objective was to develop a concept that was described as ‘Julia like’ for both the award and logo. She has been an inspiration of mine for years and having a good knowledge of her personality and background I felt very confident in producing a suitable concept for both. The target market being the culinary professionals who will win the award, along side the foundation that approved the concepts. This year Jacques Pépin; a long time friend of Julia Child’s, as well culinary author and chef personality has won the award. Which only seems fitting for him to receive the first ever of it’s kind, given he knew Julia very well. In my proposal I had developed mood boards, which were carried through the process and into development of the logo and award. I also added into the proposal a general timeline with goals and specifications to be followed so there was no loss of time or money. 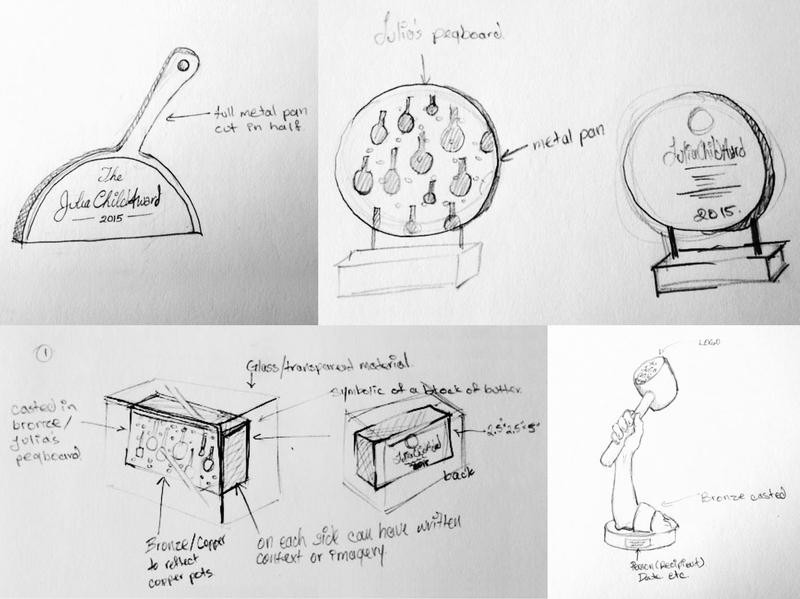 I began the project by sketching out the logo and award concepts, which were actually presented in the form of rough sketches. I felt the authentic look of a sketch would add to the custom approach to the project, as well giving a good idea of what I was initially thinking. Primarily focusing on the logo, I refined a few of the sketched logos digitally in illustrator and presented them. One main idea had sparked with the foundation. The concept that the logo resembled the teaching nature that Julia possessed. Altering the ‘u’ and ‘i’ in her name, representing teacher and student. The ‘u’ and ‘i’ was then later suggested to be a rolling pin and Julia’s infamous copper egg beating bowl. They were also drawn to the idea of the logo being in a circle format, which also had a slight detail of a fleur-de-lis; representing Julia’s French cooking. These small details were then refined and made into the logo you see today. The second stage of the project was to produce the award prototype. In the initial sketches I had made about four suggestions to the design; two of which were chosen. 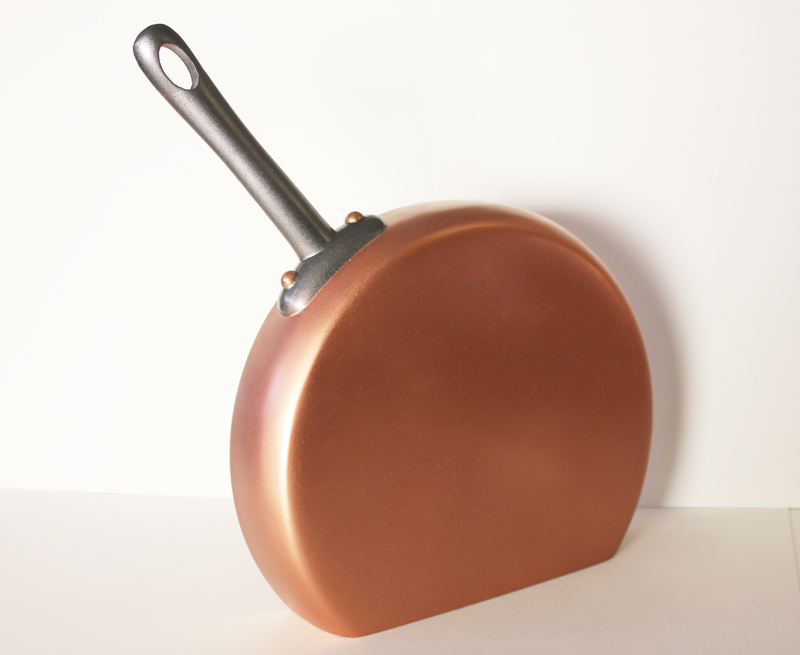 The one that the foundation decided to go with was a copper pan, which Julia loved to use making her famous omelets in. It was simply cut off at the base so it could stand on a shelf or mantle vertically. The front would have the detailed information including the recipients name and logo. Then the hard part; producing the pan as a 3D print which not knowing much about 3D editing programs was definitely a challenge. Although I managed to work my way though a lot of tutorials and teaching programs, learning how to develop a 3D prototype. Once that was complete I got a number of quotes from 3D printing companies to produce the prototype and follow through with production. Currently in the third stage, which is the process of producing the final award. Siliarly carried out as the second stage. They will be able to use the prototype to structure the award into a cast, which will make the process much easier. Once the final is produced I will be posting more images of the final result. Please stay posted! Follow Avid Creative on Facebook & Twitter for updates. Or sign up for the Avid Creative Newsletter for seasonal updates. The Foundation will present the award in association with the Smithsonian’s National Museum of American History at a gala event to be held in Washington, D.C. on October 22, 2015. 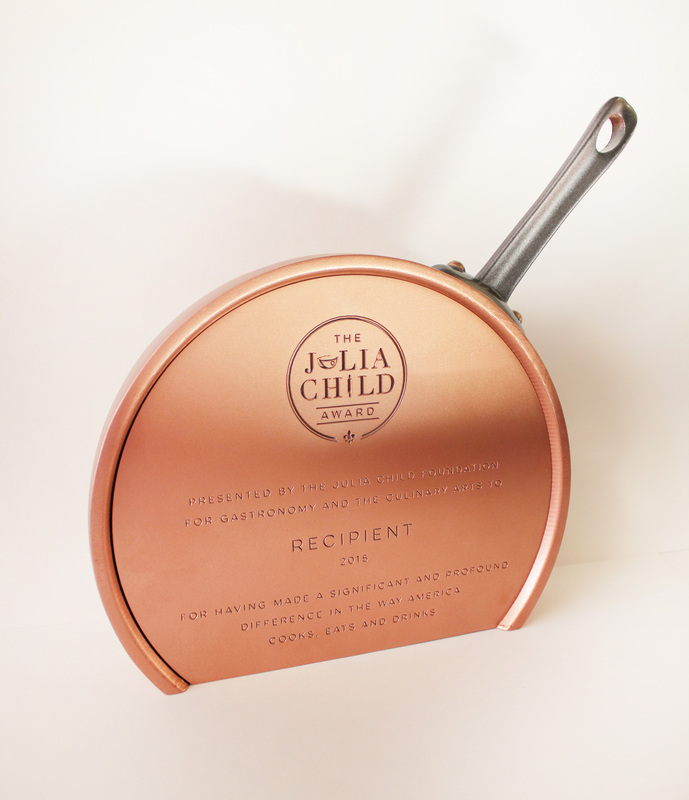 The recipient will receive a uniquely designed award engraved with his/her name and year of honor and the Foundation will make a $50,000 grant to the food-related non-profit of the recipient’s choosing. 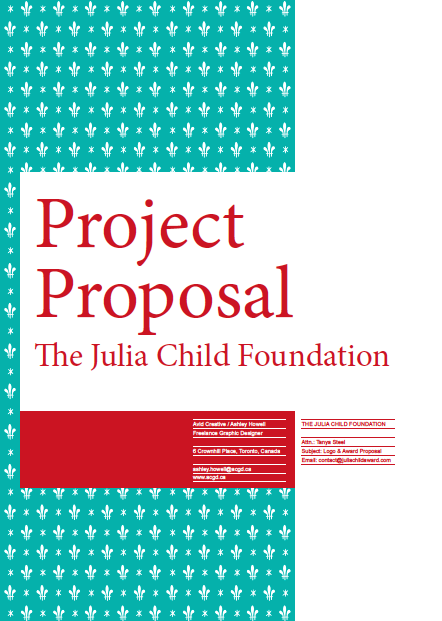 The project was highly complimented on as well taken on very well by the Julia Child Foundation. It is a great pleasure and honor to have been chosen for this project and to have produced something for one of the most inspiring people of the culinary world: Julia Child. 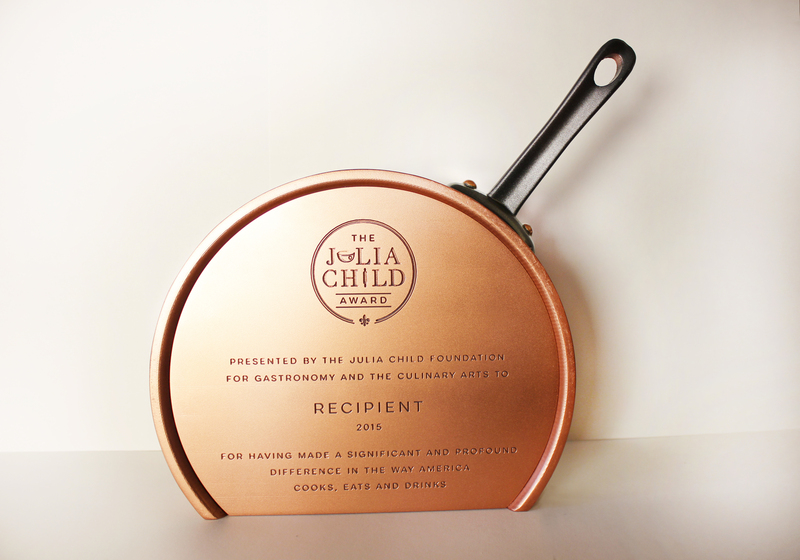 Media release posted on the Julia Child Award site — SEE IT HERE. The National Museum of American History — SEE IT HERE. Women Around Town — SEE IT HERE. Links will be added of additional media coverage. 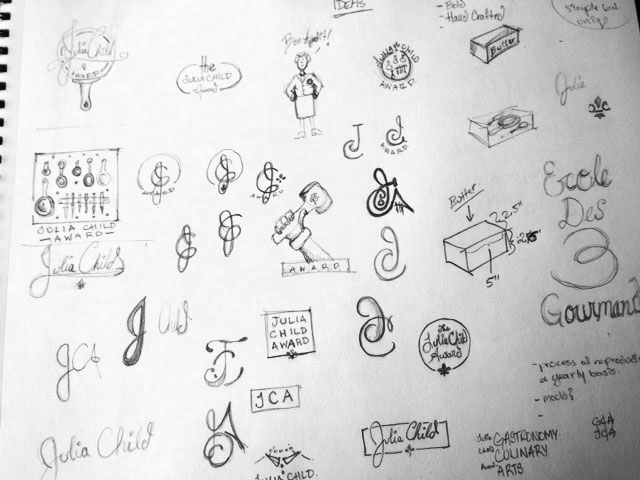 Avid Creative’s recent project for the Julia Child Foundation to design the Julia Child Award & Logo.